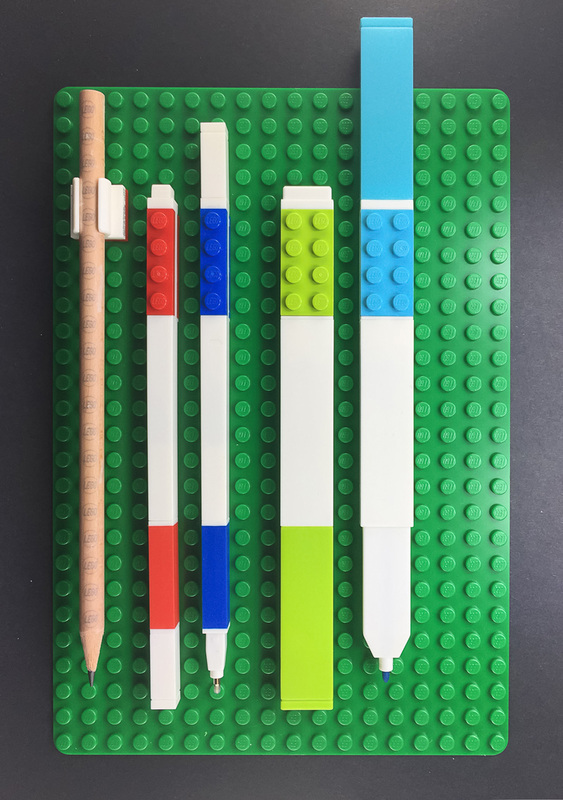 In this review, I will look at the individual items in their role as stationery and consider some of the more interesting aspects as they might apply to working with LEGO parts in general. 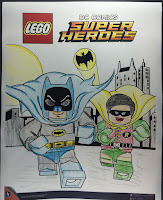 The LEGO pens – gel and felt tip – are, with lids on, both just shy of 20 studs long. They are 1x1 or 1x2 studs thick along the body respectively, although they thicken to the height of a brick at the point where 1x4 or 2x4 plates are incorporated into the body of the pen, one stud short of the top end. The lids click on to either end. 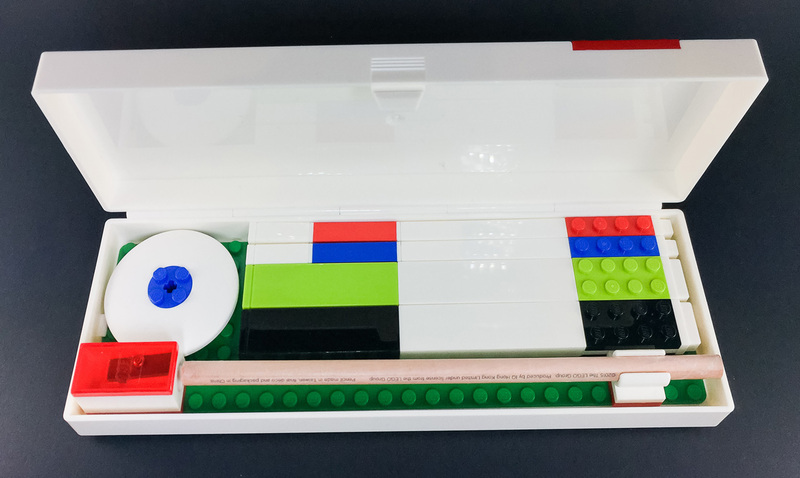 The plates allow stacking, or attaching to a baseplate such as that to be found in the pencil case and stationery organiser. 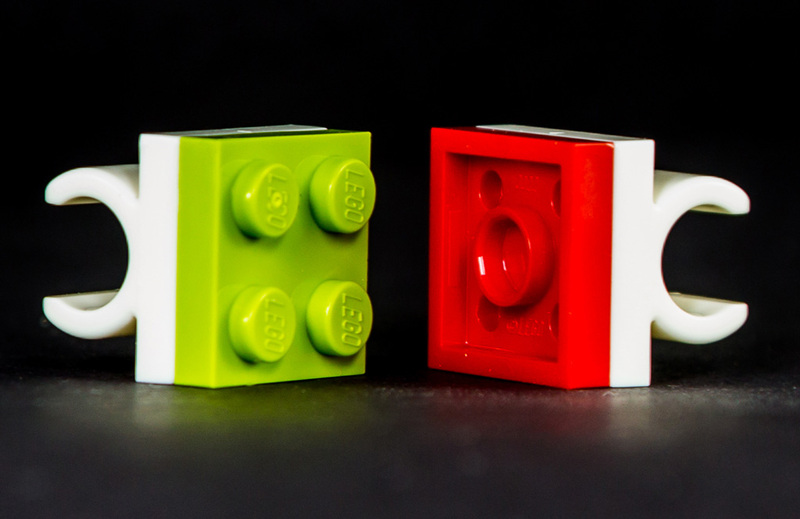 Unfortunately, this is what actual interaction with the LEGO System is limited to. The lids, externally measuring 1x1 or 1x2 studs, do not clutch onto studs. The pens can be dismantled, but this reveals no parts that may otherwise interact with the LEGO System, with the possible exception of part of the gel tube. Gel pens are available as a three-colour 'writing' set of black, red and blue, as well as being sold individually. 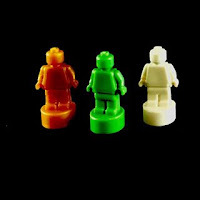 They are also available as a nine-colour pack: red, orange, yellow, lime, green, medium azure, blue, brown and black. These are also the colours that the felt tips and coloured pencils are available in. The narrow, square gel pen takes a little getting used to holding, but has a soft grip area. It is OK to write with, with easy transfer of ink to paper. However, after a day’s use it can start to feel as if it is rubbing strangely on your fingers. The pencils are available as grey lead/HB/No.2 and as packs of nine coloured pencils, in the colours mentioned above. The wood is of a pleasant grain to sharpen, and the grey lead was smooth to sketch and write with. The coloured pencils are comfortable to hold, but feel as though they are a slightly coarser grade of lead than a high grade Faber-Castell or Derwent coloured pencil. 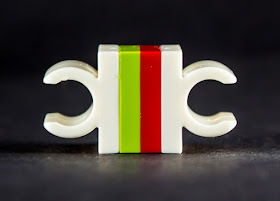 These clips slide onto the shaft of the pencils, and grip fairly firmly. There are 2 types of pencil clip: tubes out – which binds to a studded surface, or studs out – which allows you to attach your favourite (not too rare - I don’t want to be responsible for significant financial loss) minifigure or small brick model. Both therefore allow a pencil to become an integral part of a MOC, and I look forward to seeing these pencil clips as part of a ‘Spirograph’ type model, holding a pencil while the gadget guides either the paper or pencil to create an interesting design. Again, the clip does not take a stud (too small) or round brick (too big). It can however take a Technic axle connector, ideally directly connected to another with an axle. They slide in easily, but can turn, with a little resistance. Given that this would put a degree of stress on the plastic of the clip, however small, this could not be considered a 'legal' technique, but I’m sure someone will come up with a nifty use for it in the near future. Available in packets of two - a red one and a blue one. 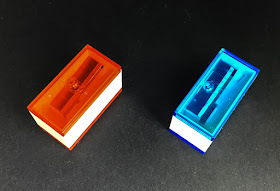 There is a 2x4 plate glued to the base of the sharpener piece, and a transparent ‘tile’ embossed with a LEGO logo that forms the lid. Again, the lid of the sharpener has the external dimensions of a 2x4 tile, but has no clutch. Conversely, a 2x4 tile or plate cannot bind to the top of the sharpener. 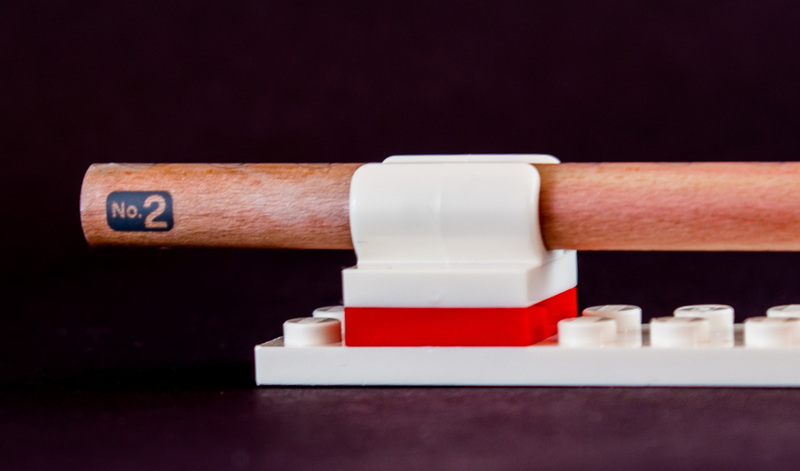 With the lid on, the sharpener measures two bricks high. Tests in the rambling bricks lab revealed it to work as a pencil sharpener, without any surprises. So, how does this measure up? (Sorry, not sorry!) The ruler is a most interesting set, and involves construction, unlike any other set in the line. 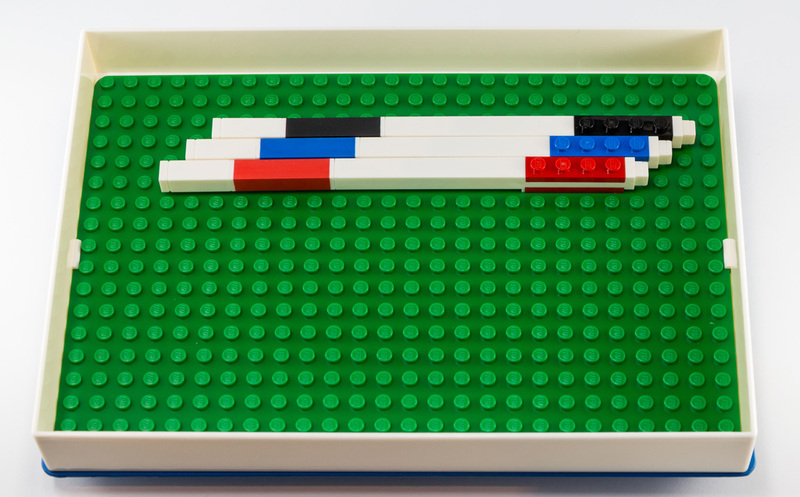 The set comes with two 4x20 stud baseplates, two 2x12 plates, a 2x16 plate, nine differently coloured 2x4 plates (go on, guess the colours, I dare you…) ten 1x8 tiles, two 2x2 tiles and two 1x4 tiles. An interesting feature about the tiles: they have centimetre markings printed in blue and inch markings in red, spread across the tiles. 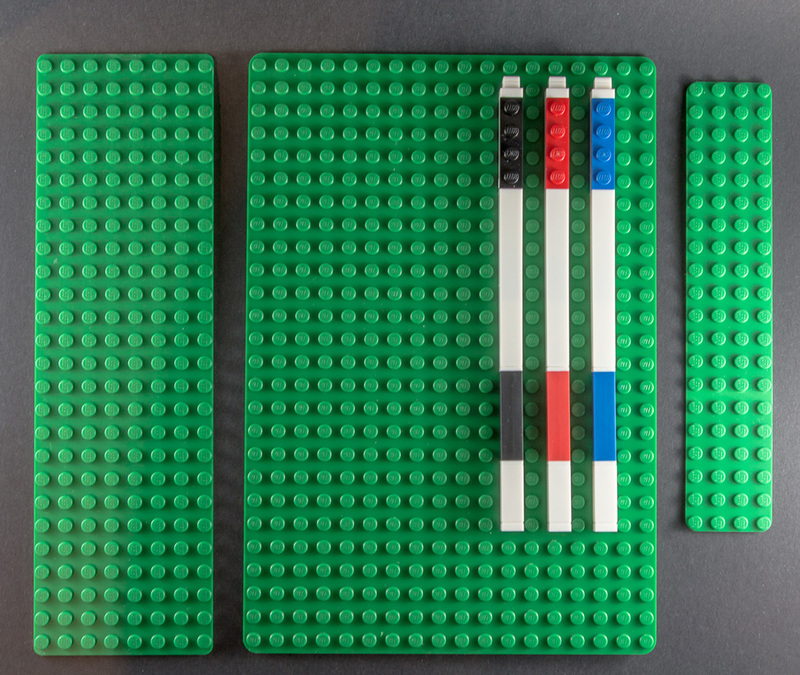 The completed 12 inch/30 cm ruler uses all of the plates and the two baseplates, and all the tiles except the 1x4s. 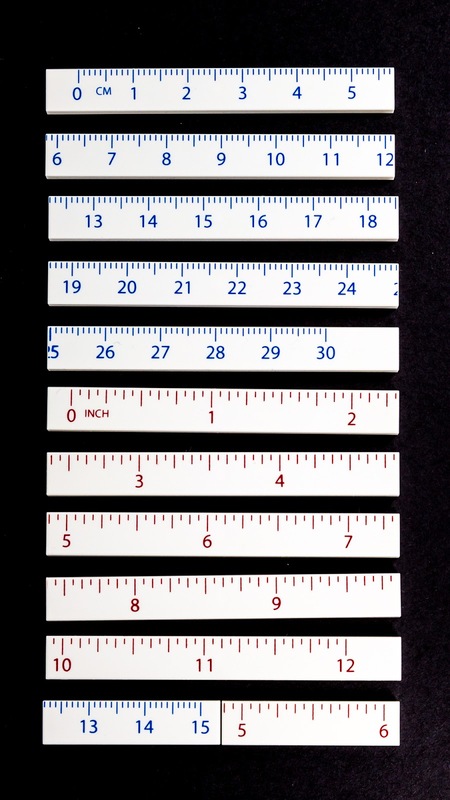 As a ruler, the measurements are accurate, and a line drawn along the ruler showed no obvious divots where the tiles met. It did not work well, however, for demonstration of the relationship between length and vibrational frequency, as we used to use wooden rulers for. Instead I got tiles falling off all over the place. This is one of my favourite elements of this line. The eraser is circular, six studs in diameter and houses a round 2x4 brick in the centre. This brick allows for a multitude of MOC possibilities. 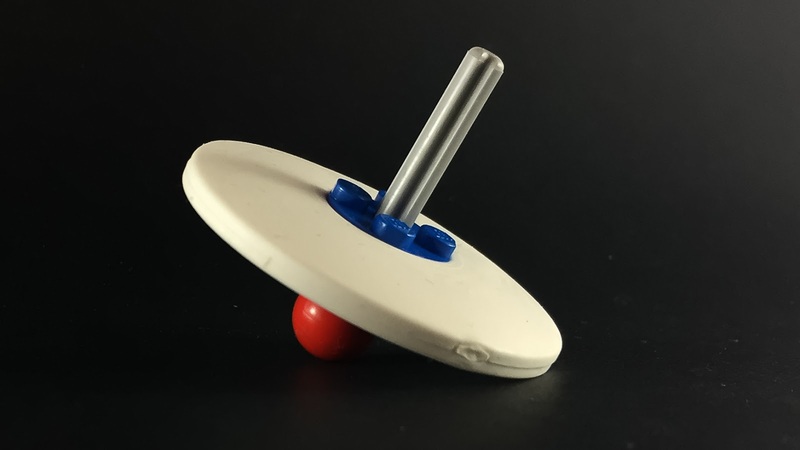 An axle through the centre of the brick turns it into a spinning top, and some significant momentum is built up, with the eraser easily spinning for over 30 seconds at a time. Passing the axle through a modified brick with a hole and into another eraser makes a terrific set of racing wheels: good weight/ diameter, with a narrow contact area with the ground. 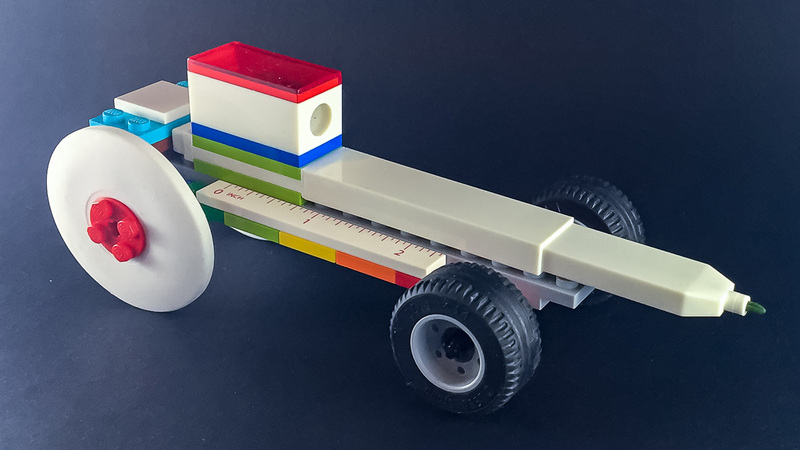 It seems to maintain momentum and kept rolling further than would be likely with normal LEGO wheels. Having an elliptical profile, it also looks like it should be attempting to invade the planet. At first impression, the pencil case is a plain white box, with a red or blue 2x4 plate embedded in the lid. It’s a box. 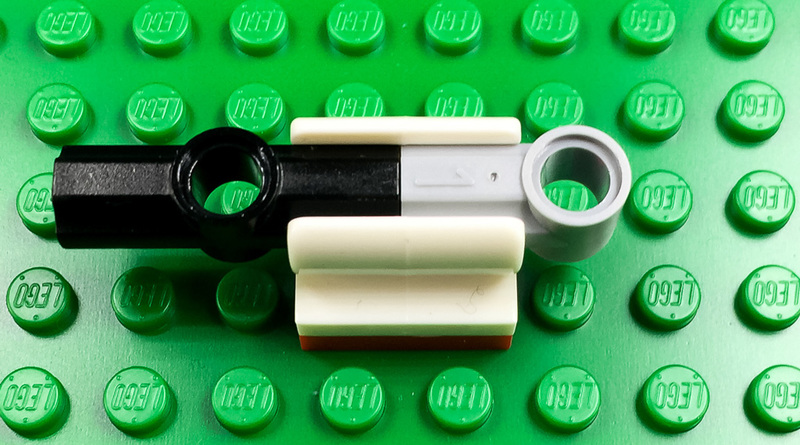 But open it up, and you discover an 8x28 baseplate clipped into the bottom. There is a hole in the bottom of the box to allow popping the plate out. Again, the plate is useful to wrangle your stationery: eraser, pens and pencil sharpener. 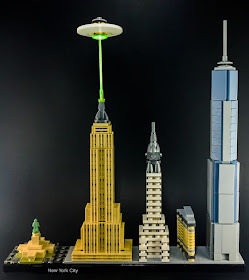 I have mentioned several different baseplates included in some of these sets: 4x20; 8x26; 18x26. These do not have any specific ID code stamped onto them so are presumably cut to size from larger baseplates. Interestingly, on reviewing my collection of baseplates, my standard green 32 stud square baseplates have no identifying mark on, while my tan and blue plates are both marked with 3811 on the reverse side. Whether this is a peculiarity of the green plates, or whether there is a ‘giant green plate that gets cut up into other sizes' is unclear, and perhaps a discussion for another time. This hardcover journal is available in blue, grey or white, and features the same design on the cover as the Stationery Organiser. 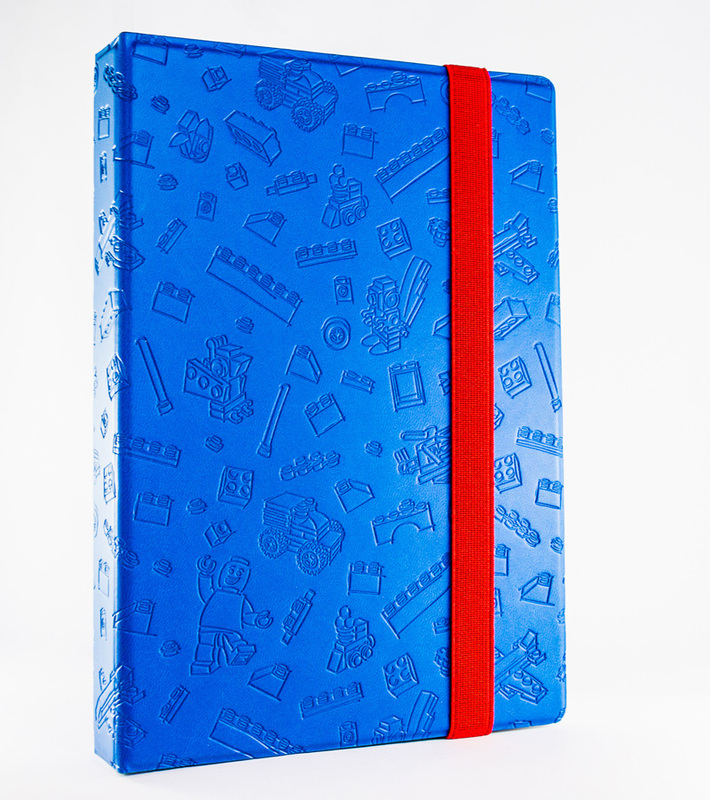 Each page is lined, and features a small LEGO-inspired doodle in the bottom corner. 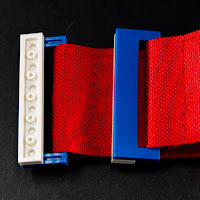 The journal also features a ‘building band.’ This incorporates a white 6x24 plate and a strap: red fabric with a small length of elastic to give some stretch. At either end, the fabric is bound through a slot in a blue, modified 2x6 tile. This tile is glued onto a 1x6 plate, which attaches to the main plate. 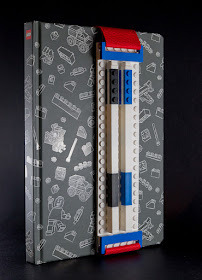 If the band is passing through the front of the book, the ‘strap binding plates need to be moved up to 4 studs in from the edge of the plate. As the band passes to the back of the journal, they can be moved out further. Unfortunately, when the binding plates are moved in, there is not quite enough room for a gel pen to bind onto the plate, without perhaps having it rest on a couple of plates, allowing it to overflow. The two-plate-high pencil clip, however, provides adequate clearance, and with room for a sharpener and eraser to bind onto the plate you would think it could be a fantastic sketch pad. It is a shame in this setting that the journal only has lined pages on the right hand page, and cannot be really used as a drawing journal. Once into the journal, however, the pens will be able to be store adequately on the front plate. 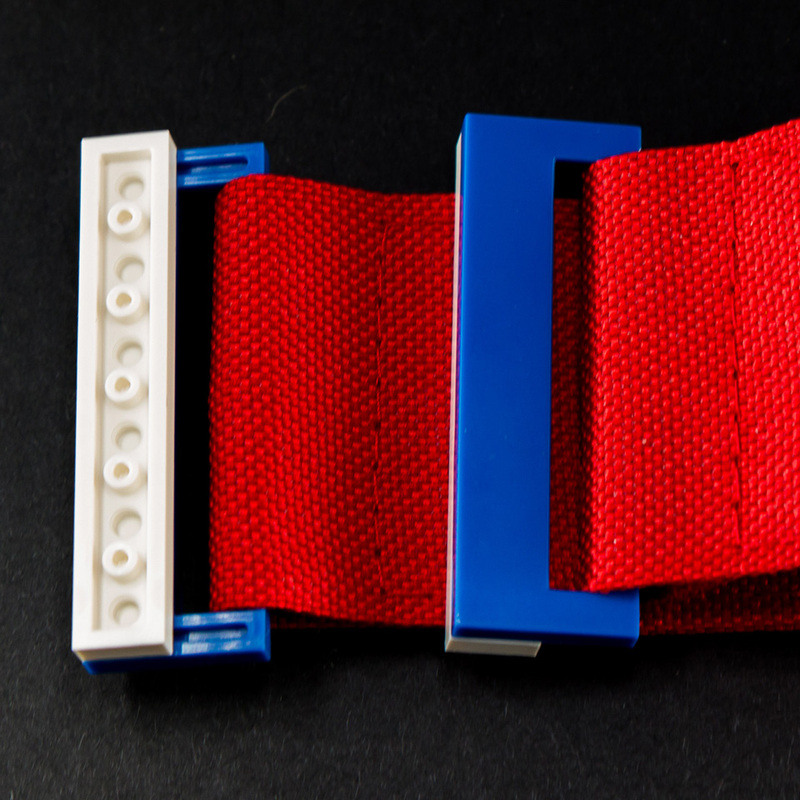 This does however, provide us with ‘LEGO sanctioned’ fabric and elastic, which in combination with the modified tiles could make an interesting banner or slingshot. Judicious use of a stitch unpicker could also leave you with the uninhibited tile/plate combination: again another potentially interesting project for someone to tackle. This line does one thing well: it provides a range of stationery that would look good on anyone’s desk – previous offerings occasionally looked childish, or like an advertisement for a specific line. The pens struck me as a wasted opportunity to incorporate the System a little more; instead there are so many elements that fit but don’t clutch, or are too large or small for standard connections. There are so many ‘near misses’ - a little too big here, a little too small there - that I wonder if it was carelessness, or deliberately avoided to ensure there was a good user experience. It may just be that in order to have a ‘stud sized connection’ on either end of the pen, there would have been a sacrifice of the smoothness of writing. And that is what a pen is really for. 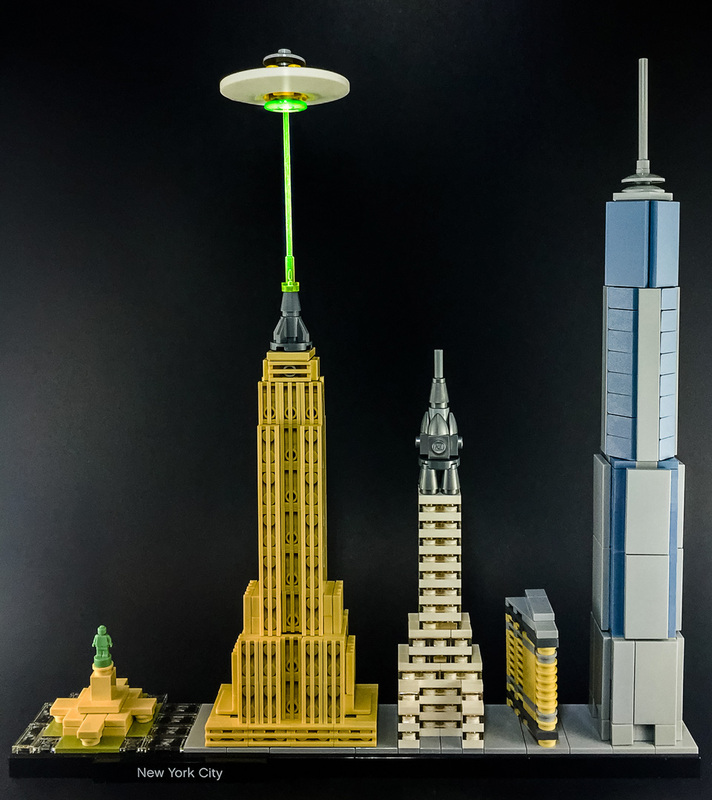 The lines of the pens do inspire the imagination, however, and as such contribute to the building process, even if you cannot incorporate them well into your model. The erasers are a great element to play with, and they remind me of the fun I had as a kid, crafting erasers into small animals with the aid of a pen knife and compass, setting them spinning on the end of pencils, and breaking them into small pieces to put into pea shooters. These erasers, however, are more readily used for good, rather than evil. My personal standouts are the different sized baseplates. I also love the pencil clips, as a way to fasten pencils to a plate, and I also look forward to seeing how these pieces may be used. All of these elements have the opportunity to be used in our MOCs. The fact that bricks and building can now be hidden and incorporated into everyday things is both intriguing and exciting. I look forward to seeing how more creative minds than mine may incorporate them into their builds. 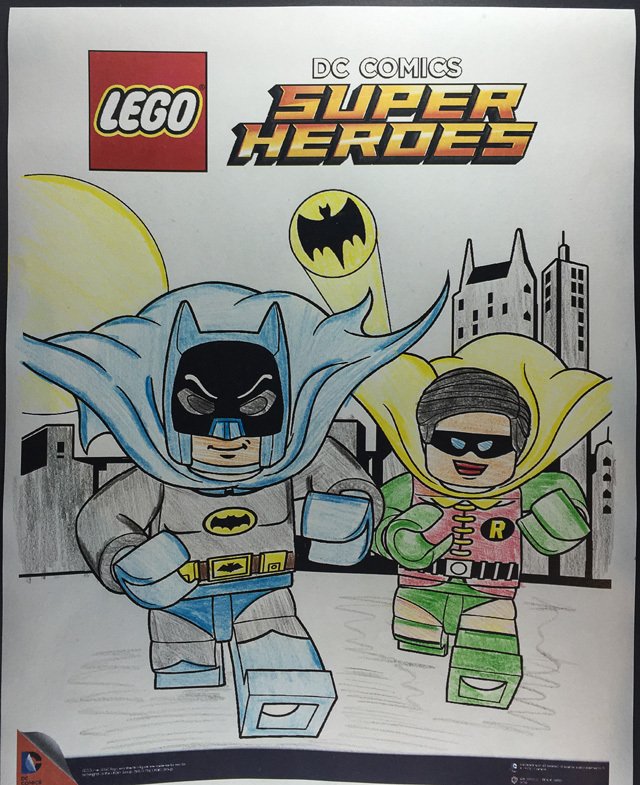 Some products mentioned in this post were kindly supplied by the LEGO Group. 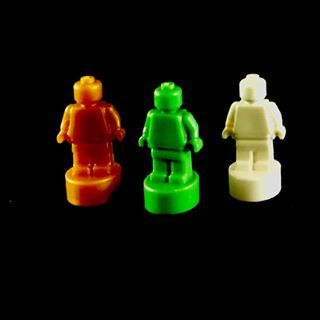 All content represents the opinions of the New Elementary and not the LEGO Group. Neat article! I would not have expected to see a review of these on The New Elementary of all places, but I have to say that as usual this blog's attention to detail makes for a review that other sites just can't match. Even as someone who has a surplus of stationery materials from years of gift-giving, these items are tempting. 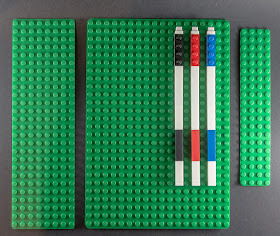 My brother has already gotten the ruler, and the markers are tempting (both due to their Lego connections and their rectangular profile which seems like it'd make them less likely to roll away than typical cylindrical art markers). 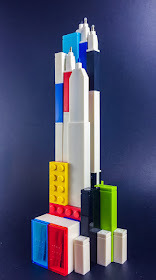 I rarely mix my hobbies of art and Lego building that intrinsically, but I could see creating an art station in my Lego room with these items handy for sketching out ideas or simply creating Lego-inspired artworks. Your idea of using the erasers as wheels is genius and I would not be surprised to see that use take off in MOCs. For that matter, the Lego integration of the other items could be handy for people creating artistic Mindstorms creations. Even the pencil case seems fairly useful, considering that the studs could help to keep your pens/pencils/markers/etc. from rolling around in transit. One thing this review didn't include that I think would've been nice is a sample sheet showing the color quality of the various gel pens and markers. 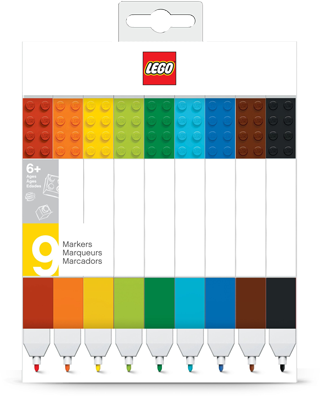 I'd be interested in knowing how well the various ink colors match the corresponding Lego colors, since sometimes the color a marker is labeled with and what it looks like on paper can be very different. 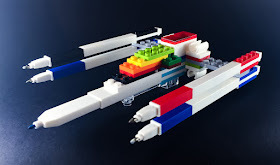 Boss X-Wing. Is that on Flickr anywhere? I'd love to Favorite it.